The board of the Tacoma-based company is one of this year's winners. PLANNING TO SUCCEED. Columbia Bank’s board of directors is cited this year for its methodical succession planning. 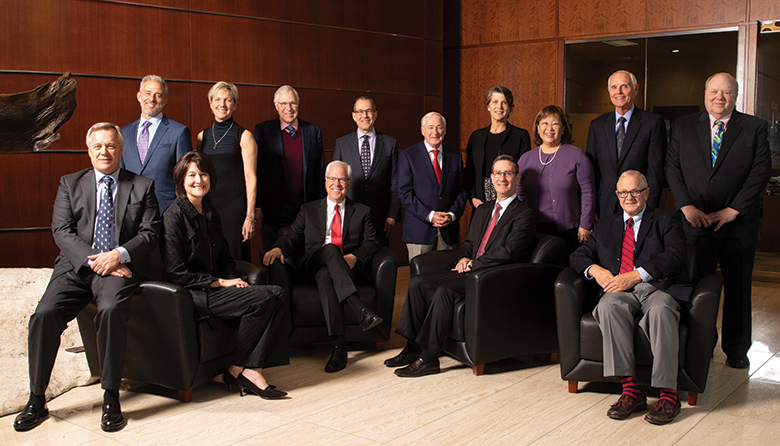 Directors are, front row from left, CEO Hadley Robbins, Janine Terrano, Chairman Craig Eerkes, Randy Lund and Tom Hulbert, and back row from left, Eric Forrest, Betsy Seaton, Bill Weyerhaeuser, Mark Finkelstein, John Folsom, Michelle Lantow, Mae Numata, David Dietzler and Ford Elsaesser. But Columba’s board wasn’t caught unprepared. It had already begun succession planning in anticipation of Dressel’s eventual retirement, starting with the selection of search firms to identify internal and external candidates for the CEO’s job. “One of the top responsibilities of any board is succession planning,” Eerkes says. “It’s where the board is completely accountable,” and its decision can have significant consequences. Then-Chairman William Weyerhaeuser took other steps to make for a smooth transition, Eerkes recalls, including immediate and reassuring communication with various constituencies — including a bank Columbia was in the midst of acquiring. The entire board was included on each step in the selection of the next CEO. Eventually, Chief Operating Officer Hadley Robbins was named CEO. “It came off very well,” Eerkes reports. It’s a model Eerkes intends to follow as Columbia continues succession planning for its next CEO, talking to search firms and identifying internal candidates who can be given increased responsibilities and opportunities to learn. “We want to have that plan in place,” he says.